Stanley J. Jackson of Bremen passed away Wednesday, September 12, 2018 in a local hospital. He was born in Bremen, May 9, 1935, son of the late James Franklin “Pete” Jackson and Effie ‘Jackson’ Jackson. 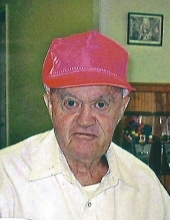 Stanley was a employee of Ingle’s for twenty-seven plus years and was a member of the First United Methodist Church of Bremen. In addition to his parents, he was preceded in death by brothers, George and Bell Jackson, Henry Jackson, Jack and Lula Jackson and a brother-in-law, Kenneth Thompson. Survivors include a sister, Flora Mae Thompson of Tallapoosa; special friends, Faye Ward and Donnie Rogers of Bremen; nieces and nephews, Michael and Tewanna Thompson, Judy Ridley, David and Amanda Craven, Christian and Michelle Evans, Daniel and Brianna Carnes, Casey Cantrell and Matt Sanders, Chris and Ashley Thompson, Josh and Alyssa Cantrell plus other nieces and nephews and all the Citizens of Bremen. The family will receive friends at the funeral home Friday from 6:00 until 9:00 PM. Services will be Saturday, September 15 at 2:00 PM from the chapel of Hightower Funeral Home with Reverend George Pike officiating. Music will be furnished by Sharon Sewell accompanied by Sara Calhoun. Christian Evans, Michael Thompson, Daniel Carnes, Shane Murdock, Johnny Rogers, Keith Parrish, Chris Thompson and Jimmy Rogers will serve as pallbearers. Interment will follow in Bremen City Cemetery with Dakota Evans officiating. To plant a tree in memory of Stanley J. Jackson, please visit our Tribute Store. "Email Address" would like to share the life celebration of Stanley J. Jackson. Click on the "link" to go to share a favorite memory or leave a condolence message for the family.